A solid-state drive (SSD, also known as a solid-state disk although it contains neither an actual disk nor a drive motor to spin a disk) is a solid-state storage device that uses integrated circuit assemblies as memory to store data persistently. 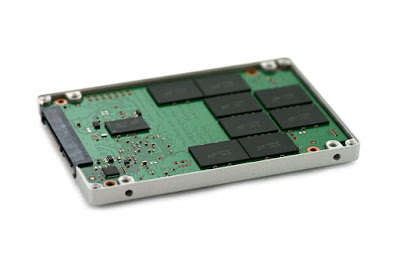 SSD technology primarily uses electronic interfaces compatible with traditional block input/output (I/O) hard disk drives, which permit simple replacements in common applications. Additionally, new I/O interfaces, like SATA Express, have been designed to address specific requirements of the SSD technology. SSDs have no moving (mechanical) components. This distinguishes them from traditional electromechanical magnetic disks such as hard disk drives (HDDs) or floppy disks, which contain spinning disks and movable read/write heads. Compared with electromechanical disks, SSDs are typically more resistant to physical shock, run silently, have lower access time, and less latency. However, while the price of SSDs has continued to decline over time, consumer-grade SSDs are still roughly eight to nine times more expensive per unit of storage than consumer-grade HDDs. 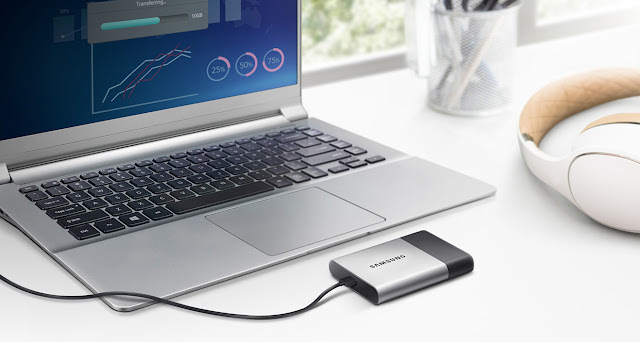 Samsung announced the launch of Samsung Portable SSD T3, an external solid state drive (SSD) that offers multi-terabyte (TB) storage capacity and comes equipped with Samsung’s proprietary Vertical NAND (V-NAND) and SSD TurboWrite technology. Samsung is said to be leading the market by offering a new 2TB T3 SSD, along with capacity options including 250GB, 500GB and 1TB respectively. The drive comes with sequential read/write speeds of up to 450 megabytes per second (MB/s) with a USB 3.0 interface – up to 4X faster than external HDDs. The responsiveness is said to be as fast as internal SSD with random read/write speed up to 240X faster than external HDD. It weighs about 51 grams and measures 74x58x10.5 mm. It features aesthetics such as dark silver metal with black design and anti-scratch urethane coating. T3 uses exFAT, a widely adopted file system, as its default file recognition format and also works with a complementary Samsung Portable SSD Android mobile app, which supports password changes and remaining capacity checks. “With digital content on the rise, consumers, content creators, and business professionals are in need of a high-speed, reliable and secure storage which is accessible from multiple devices such as PCs, smartphones and tablets. Samsung is leading the way in redefining and revolutionizing the external storage market with the success of Portable SSD T1 launched in 2015. We will set new benchmarks with the new Portable SSD T3 without compromising on storage capacity, style and security,” Mr. Sukesh Jain, Vice-President, Samsung India Electronics, said. With no moving parts, the drive is designed for portability and can withstand bumps and drops that are majorly responsible for lost or corrupted data. T3 uses exFAT, a widely adopted file system, as its default file recognition format to create a seamless user experience. T3 also works with a brand-new complementary Samsung Portable SSD Android mobile app, which supports password changes and remaining capacity checks. The internal frame offers shock resistance of up to 1,500G and resistance up to two meter drop test. It has a thermal guard, which efficiently manages workload to prevent overheating.